Absolutely gorgeous collection of black and white images - primarily of wildlife from East Africa. 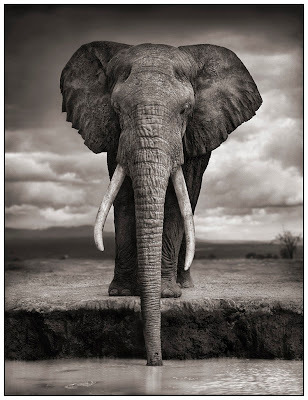 Nick Brandt presently hails from Topanga, CA. Check them out here. The following is from his site. "Few photographers have ever considered the photography of wild animals, as distinctly opposed to the genre of Wildlife Photography, as an art form. The emphasis has generally been on capturing the drama of wild animals IN ACTION, on capturing that dramatic single moment, as opposed to simply animals in the state of being. I get extremely close to these very wild animals, often within a few feet of them. I don’t use telephoto lenses. This is because I want to see as much of the sky and landscape as possible--to see the animals within the context of their environment. That way, the photos become as much about the atmosphere of the place as the animals. And being that close to the animals, I get a real sense of intimate connection to them, to the specific animal in front of me. Sometimes a deliberate feeling that they’re almost presenting themselves for a studio portrait."